“Arabic Second Language Learning, Teaching, and Testing"
to be held at the University of Michigan, Ann Arbor, September 1-2, 2018. The conference is an open forum for scholars interested in exploring empirically topics and issues in Arabic applied linguistics and second language acquisition. The conference themes are Arabic second/foreign language learning, teaching, and testing as well as the interface and connections between them. Following the conference, papers which are recommended by external peer reviewers will be published in Al-‘Arabiyya (The Journal of the American Association of Teachers of Arabic). The panel will take place on Friday November 17, 2:00 p.m. in conjunction with the Annual Meeting of the Middle East Studies Association (MESA) November 18-21, 2017 in Washington, DC 2017 at the Marriot Wardman Park Hotel. Presentations will focus on current and innovative techniques to address the challenges of teaching Arabic as a second language, including Arabic as a heritage language. Your proposal should be 250 to 300 words (excluding bibliography). While either English or Arabic can be used, panelists are strongly encouraged to deliver their presentation in Arabic. Abstracts can be in either Arabic or English. Please send your proposal to Brahim Chakrani (chakrani@ msu.edu) by April 20, 2017. You must have “AATA panel” in your email subject. Late submissions and abstracts exceeding the word limit will not be accepted. Notification of acceptance will be sent by April 27. Note: the panel's room number will be posted at a later date, and after your proposal is accepted, inform Brahim Chakrani of the technology that you may need for your presentation. 11:45 - 12:15 How Do Communication Problems Direct American learners of Arabic to Notice Syntax and Morphology? 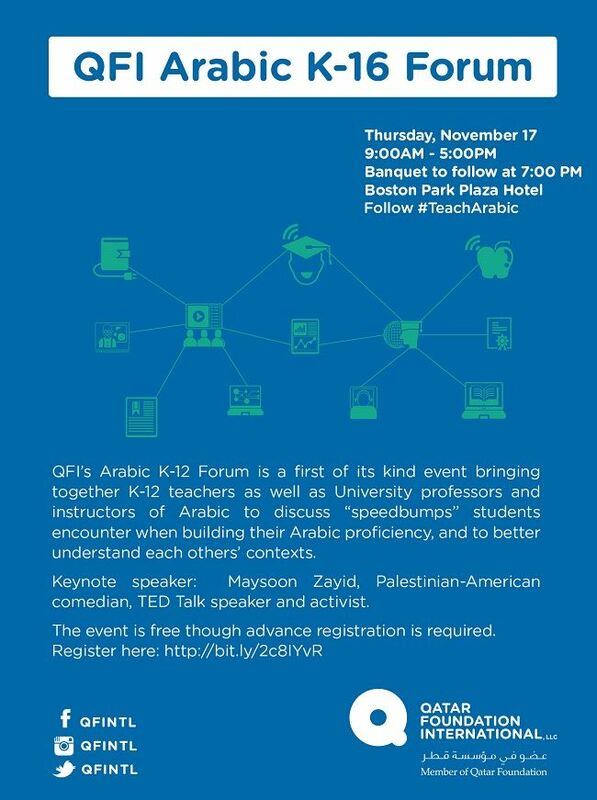 The American Association of Teachers of Arabic (AATA) invites members and other professionals in the field of Arabic teaching to submit proposals for participation in a panel on “Arabic Foreign Language Pedagogy: Current and Innovative Techniques.” The panel will take place in conjunction with the Annual Meeting of the Middle East Studies Association (MESA) on Thursday, November 17, 2016 in Boston, Massachusetts. Presentations will focus on current or innovative techniques and demonstration of such techniques in developing the language skills as well as the teaching of the various language components. use of state of the art technology in teaching Arabic. While either English or Arabic can be used, panelists are strongly encouraged to deliver their presentation in Arabic. Please send your proposal to aata-panel@outlook.com by April 10, 2016. Your proposal should be 250 words. Notification of acceptance will be sent by April 25. "Investigating Arabic Second Language Learning: Empirical Findings and Trends"
Following the conference, papers which are recommended by external peer reviewers will be published in a book under contract with Routledge.